If you've mastered the mapreading basics we talked about in the first navigation article and you've located a good topo map of your hunting area, then you need one more thing before you head off the beaten path on a scouting expedition- a good compass. I'm not talking about the cheap little things you hang on your jacket zipper or slip on your watch band. I'm talking about a real outdoorsman's compass. 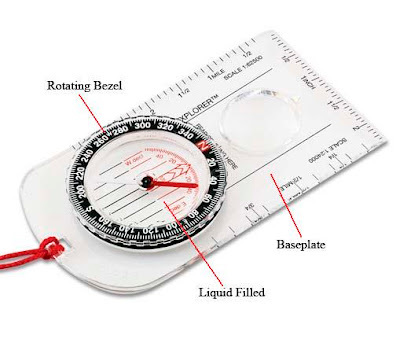 There are three important things to look for in a compass, a rotating bezel that allows you to set the compass for any direction of travel, a baseplate for aligning with map features, and a liquid filled capsule that helps steady the needle. The basic Silva compass pictured above retails for about $20. AS you can see from the photo below, I prefer to use a compass with sighting capability like the Silva Ranger . Of all the things that a compass is useful for, like locating likely locations for a dominant tree the most basic - and most important - is keeping your topo map oriented with the world, just like a car GPS rotates the road map around as you make turns so that the map is aligned with the road you're driving on. Here's how you do it. Set your compass bezel to 360 degrees (straight north) and align one of the long sides of the base plate with any north-south feature on the map. I normally use an edge of the printed area or a fold that I've made carefully so that it is aligned north and south. Make sure that the north mark on the bezel points toward north on the map. Now rotate the map and compass together until the north needle lines up with the little arrow underneath it. Once that is done, your map is oriented to the world around you. If you are scouting in unfamiliar territory, keep your map and compass in your hand as shown above. Stop frequently, orient the map, look around at the land features and compare them to the map. Start doing this at a known location like an intersection or some other obvious feature on the map. As you travel, keep up with your location on the map using the stop, orient, look around approach. Make a mental note of your location. If you don't trust your memory, put your thumb on your location and keep it there until the next time you stop and re-evaluate your location. It may sound like a lot of work to do this, but trust me, it beats walking for twenty minutes then trying to remember how many ridges you've crossed. This brings up the most basic rule of navigating in the woods. The best way to avoid getting lost is to stay found. In other words, if I know where I am on the map, I can always find my way to wherever I want to go. We'll talk about how to do that next time. Cris, I purchased the USGS Topo maps you are using and your right they are fantastic. I take the map and extend the magnetic north line then use that line to orient my map with my compass north, is this correct? You can do it that way, but you will probably loose a little accuracy trying to line up your comapss needle with the little magnetic north arrow. A better approach is to set the declination on your compass, then just line up the true north lines (the parallel lines inside the bezel of the compass) with the left or right margin of the map. If you carefully fold the maps like the one shown above, you can line up the true north lines with the north-south fold of the map.